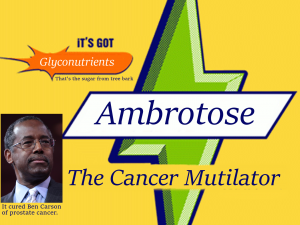 Ben Carson endorses Ambrotose to a convention of Mannatech salespeople. Mannatech is a multi-level marketing firm that can cure cancer, aids or autism. Dr. Ben was diagnosed with prostate cancer at a relatively young age. Fortunately, being a famous and well respected doctor, he got the highest standard of care anyone could get in the USA. (We should all become doctors and not lazy working at the local McDonald’s welfare bums living off Obamacare.) In the aftermath of his diagnosis, people started sending him hundreds of different herbal remedies. He says he could have started a store, but one person told him about a miracle cure. And now he came back and probably out of the kindness of his heart and told his testimony of how Ambrotose cured him. Here he starts speaking about his prostate cancer diagnosis. Here he begins speaking about the product itself. It was a fellow doctor named Dr. Reggie that told him about it. Dr. Reggie “prescribed” it to him. Dr. Ben says withing three weeks of taking the product the symptoms of his prostate cancer went away! This stuff must be Jesus in a bottle! It’s got glyconutrients. What are glyconutrients? It’s got what your body craves and they can fix anything. You all even have the opportunity to sell this miraculous product with Dr. Ben. But you’ll want to get your hands on this stuff first. You can buy 120 grams of this miracle cure for only $125. That is only a fraction of the cost of chemotherapy or surgery and I am sure it works just as well. And if not, it was all a part of God’s plan. 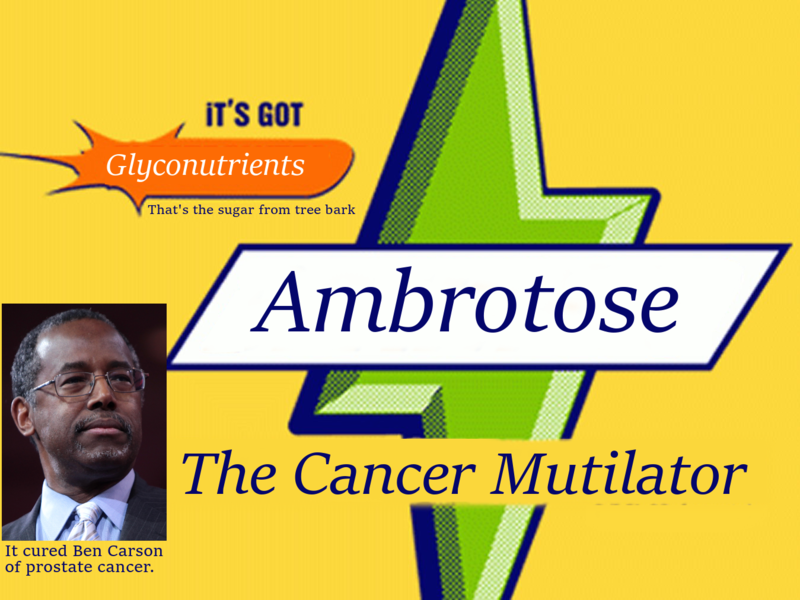 I wonder how Dr. Ben got the glyconutrients to his prostate. Did he swallow them or was there a funnel, a mallet and Mrs. Carson included? But wait, there’s more stuff you can buy from Dr. Ben. You can purchase 120 capsules of glyconutrients from tree bark for only $52! And you’ll want your brain to work better after buying the other two items. For that, there’s Nutriverus. It’s got glyconutrients for your brain. And it’s on sale for only $49!! 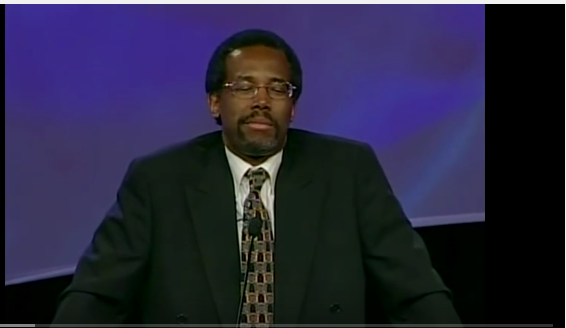 You can really tell Dr. Ben takes a lot of this stuff. And you can too. If Dr. Ben is any indication, Nutriverus will make you as smart as a neurosurgeon. So buy lots of this stuff! It’s gotta be good for you. It’s got Glyconutrients, for the love of God!